William J. Good joined Phi Kappa Psi in 1969 and since that time both he and his wife Lindy have had a transformational impact on the Iowa Beta Chapter and the Phi Kappa Psi brotherhood. Bill and Lindy both have been steadfast in their commitment to the Fraternity and have also continuously inspired and encouraged others to make the most of their Phi Psi journey. From his earliest days, Brother Good has been involved in the life of the chapter serving as recruitment chair, corresponding secretary and later treasurer. Bill found time to not only lead his fellow brothers but also displayed a commitment to his academic studies often recognized as an undergraduate for his impressive GPA. Bill later shared his gifts with numerous other chapters during his tenure on the national staff. Bill was a popular facilitator at campus Interfraternity workshops and a sought-after field secretary specializing in recruitment. He was also known for his administrative work on staff and his drive as an appointed officer to develop a meaningful fraternity education model. Integral to the revival of Iowa Beta, after a nearly decade hiatus, was the personal dedication of Bill and Lindy. Serving as house parents, both Bill and Lindy were instrumental in the re-chartering of the chapter, the physical improvements made to the facility and certainly the development of the young men who called 316 Lynn Avenue home. Without Bill’s persistence, guidance and advice, and Lindy’s mothering spirit and warm demeanor, the Iowa Beta Chapter would be very different. 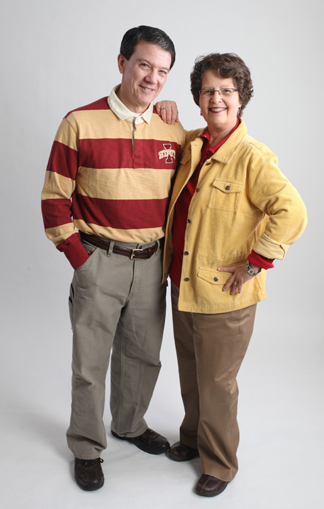 Recognized by the chapter, the Iowa State campus, the Central Iowa Alumni Association and the national Fraternity, both Bill and Lindy single-handedly have touched hundreds of lives for the better. Today, we thank these two distinguished individuals by establishing a scholarship fund in their honor. Known as the William and Lindy Good Scholarship, the award will be given annually to an Iowa Betan with demonstrated financial need, a strong academic record, a passion for community service and philanthropic involvement and leadership aspirations. This award will embody the spirit of both Bill and Lindy and forevermore their legacy will be felt within the Iowa Beta Chapter.